motocross game or the online dirt bike game as its sometimes called. Motocross madness, and dirt bikes games. The motocross game - A Review of Two of the Best. For any fan of dirt biking, the real draw of the game is the thrill and the adrenalin rush. However, regardless of how much an average person may like dirt biking as a sport, it would be unfeasible for him to actually take it up for himself. The reason for this is simply that, in order to be a part of dirt biking, you not only need to invest a lot of money but also put your body on the line because the sport is very risky for amateurs. This means that while a football fan can play football in the local park and a tennis player can play tennis in the local club, a dirt biking fan cannot do these things. 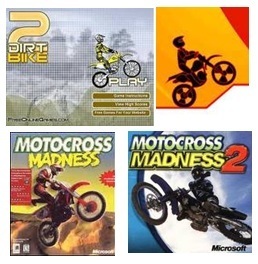 The only solution to a dirt biking fan, therefore, is a motocross game played either on a gaming console or computer. 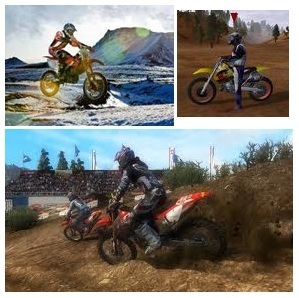 If you have come to the same conclusion and are looking to find out the best motocross games in the market, then the following two reviews would come in handy for you. Motocross Madness 2 is a game that has quickly captured the imagination of dirt biking fans all over the world mainly because of its entertainment value. However, while the game is, by far, the most enjoyable in the industry and has been an instant hit amongst fans, it has done this by giving up on realism. For example, one of the most fun aspects of the game is that it allows you to pull off stunts and antics that real world dirt biking professionals would be scared of even thinking about. It is also worth noting that while Motocross Madness was a big hit with fans, Motocross Madness 2 has gone on to make even bigger splashes in the sea of fans' happiness. Motocross Madness 2 is better, more fun, more unrealistic and more addictive than any other motocross game. Top motocross games and dirt bike games. While Motocross Madness 2 is a motorcross game that people love for the amount of fun it provides, MX Unleashed is a game that is highly respected and desired by the real fans of dirt biking simply because of its realistic gameplay. As a result of the realistic nature of the game, it is preferred by many dirt biking purists who want a real experience more than entertainment. Another reason why this game is popular amongst dirt biking purists is the fact that its graphics are easily the best amongst all motocross games in the industry. It has a detailed and extremely varied career mode that provides you with the classic motocross racing experience with the help of long lap based tracks and competitive AI racers. In fact, you will be able to experience motocross with 24 Supercross indoor tracks and 22 outdoor tracks coming to a total of 46 tracks. In addition to this, there is the freestyle aspect of the game with its own underlying variations. Therefore, the variation that this game offers gives it a very potent replay value, which basically means that you, the player, will take a long time before you have done everything in the game.